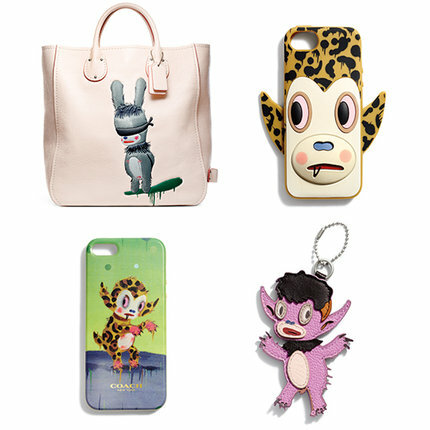 Here are our top picks for the week! 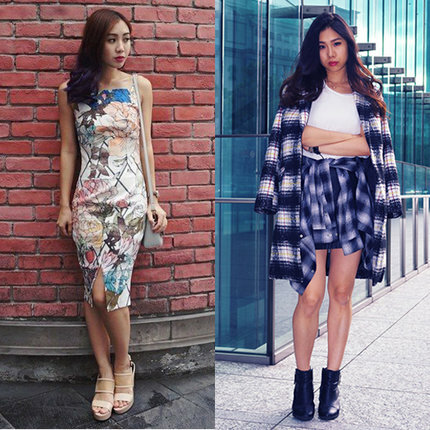 It's been a tough week last week but these OOTDs have kept us inspired. Fashion is not just all about the glitz and glamour, it's also about expressing yourself--an outlet you can use for what your mood is. These OOTDs have brightened up the week for us--from whites, summery-looks, and all-black ensembles. Nothing is as ladylike and as comfortable as this light-coloured outfit from Clozette Ambassador Melissa Ferosha. This outfit manages to look classy, feminine, and summer-y all at once and that's why we love it. Perfect for those sunny days and activities beside a pool or a beach. We love corporate-chic looks that aren't boring. What makes this outfit from Star Clozetter zitacsaszari standout is the mix of animal print, denim,and stripes. 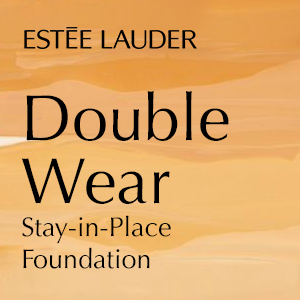 Now that's a look you can pull-off from day to night. This travelling Clozette Ambassador is at again with her lovely and refined style. 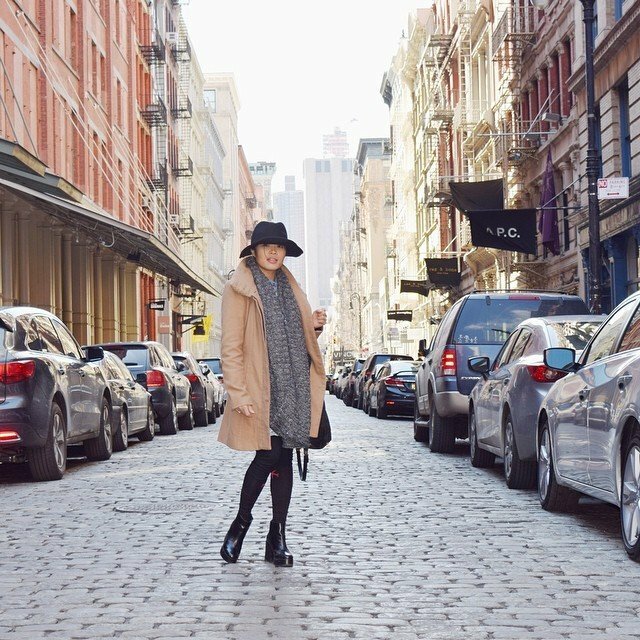 Coat, scarves, and boots are perfect for the cold weather (even if it's extra hot in our region); and hannatantoco styled it wisely by using neutral colours. 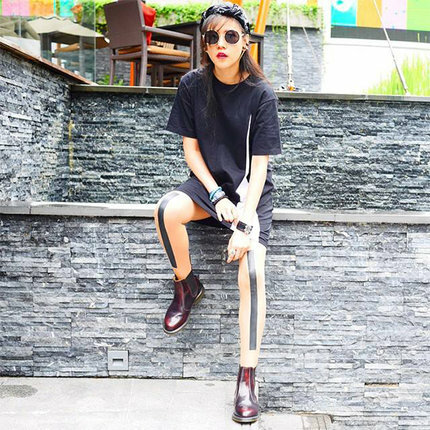 Elegance in a photo, that is what this OOTD from Clozette Ambassador Chevronz is all about. The faux fur and clutch are everything! What a way to amp up a glamorous style. 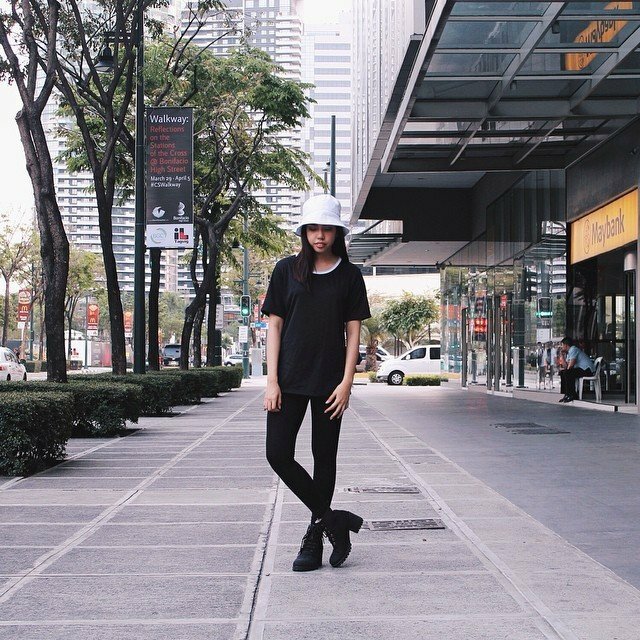 Only a few can pull-off wearing a bucket hat and Clozette Ambassador GelaMunoz is one of them. The hat is an absolute standout, with the white trimming on her shirt complementing it perfectly. This look is minimalist, monochrome, and boyish at its finest. Their message was clear: inspire the next breed of talented Filipino designers to push the boundaries of Philippine fashion and be fearless in their quest to get out there and connect with consumers. With Manila Fashion Festival, Art Personas didn't just aim to put on a great show, they were on a mission to bring the fashion from the runway straight into the hands of consumers in a manner that still felt like one was engaging in the purchasing of artistry rather than another piece of clothing to add to the wardrobe. It is this artistic accessibility that made the event a stand-out from other events in the region. Art Personas granted each designer full creative control which translated well on the runway and even in their display at the SOMA Stores at Green Sun. 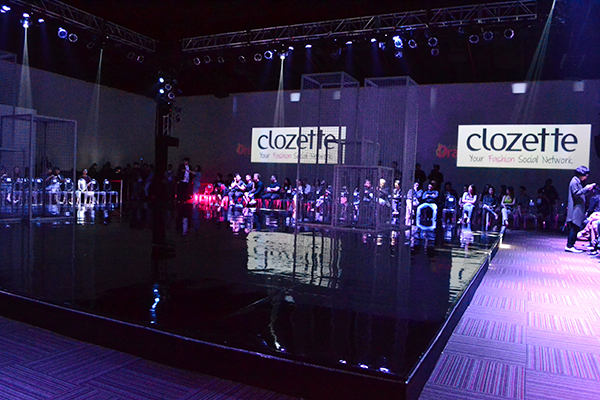 This created a laid-back, ever-inviting atmosphere which allowed patrons to fully absorb the collections on-and-off the runway. 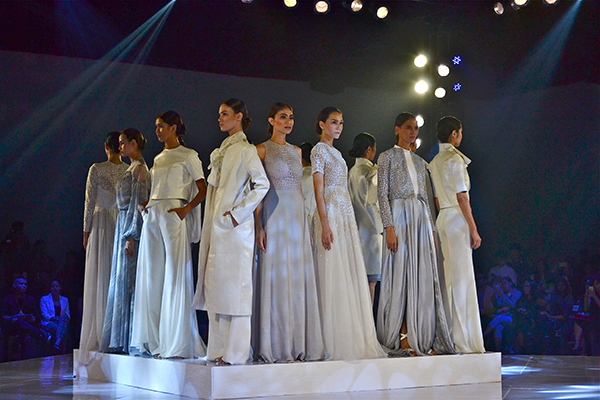 Held at Green Sun Hotel from 19th - 22nd of March 2015, Manila Fashion Festival saw twenty-six Filipino designers take to the runway with their Fall/Winter 2015 collection, presenting a mix of the F/W standards with twists and turns along the way. With 4 days, 26 designers, and hundreds of looks sent down the runway, here are the standouts we loved. With his collection Finding Absolem, Jerome Salaya Ang presented a visual splendour inspired by the maze of life. With whimsical, flowy pieces rooted in the sense of reformation, the collection presented a palette that saw a mix of that hazy aura of Spring/Summer with a touch of Fall/Winter broodiness. Think floral, exaggerated textures, and feminine silhouettes with the constant cloud of change overhead. There was darkness there, especially in its presentation, and yet the pieces still had that light and airy quality to it, making the collection a spectacle to behold. 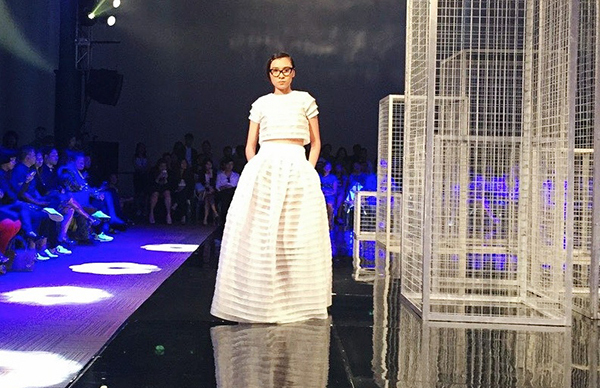 Jot Losa's collection Pale Beauty isn't just about elegance--it's loaded with feelings. From the choice of music, lighting, and down to the way each piece moved down the runway, there was this heightened focus on the depth and dimension of each piece. Moving in a rhythm that went hand-in-hand with the bold A-line shapes and structured lines, the collection was a fusion of layers and textures all juxtaposed against a backdrop of a cold winter palette--light shades of white and grey. There was structure and yet a breakdown of it, with pale, muted emotion captured within the pieces. The first thought that came to mind as Michael Leyva's collection Dark Romance hit the runway: he isn't holding back. It's all about the drama of the visual experience rooted in this classy, sophisticated need to capture the right attention. The collection displayed distinct embroidery details, playful art deco, and elaborate cut outs that accentuated the feminine silhouette--all placed against a backdrop of bright club lights and pulsing music. Taken as a whole, it felt as if he was able to turn an epic night-out into a parade of dresses, gowns, and jumpsuits, slowly getting more intense and dramatic as the night went on. 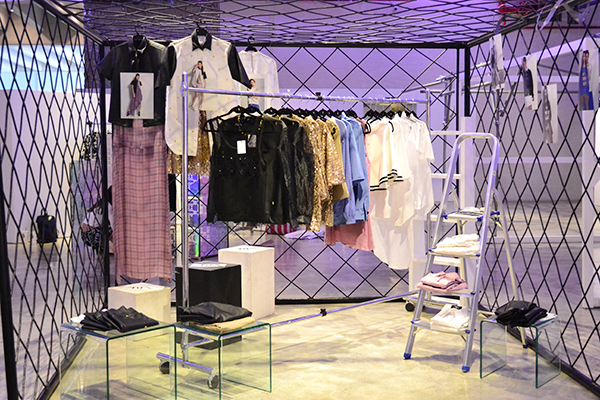 Art Personas' in-house label ARIN hit the runway with the collection Pretty Vacant, putting its own twist on grunge. It is stylized streetwear that captures the diverse era of the punk movement, with pieces styled together to exude raw edge. Sporty, boyish, yet lightly cinched in at the right places, the boxy-yet-feminine silhouettes are mixed with a Fall/Winter palette for that chill yet broody attitude. 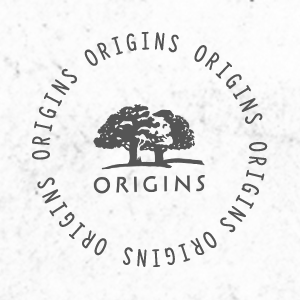 Casual, comfortable, and with extremely wearable individual pieces, it is a collection that's looking to break into the scene and become our new alternative to highstreet fashion. Esme Palaganas brought the era of Jane Austen into the modern world with her collection A Letter To Jane. With long, full boxy skirts with roomy, breathable silhouettes, the collection is almost a sign of rebellion when juxtaposed against others. Models strutted the runway in black-rimmed spectacles and strappy sandals, all styled against a backdrop of dark, heavy nonchalance. With its mixed palette of whites, blacks, blues, and reds, it's a dramatic display heightened by its stylistic presentation that truly mirrors the unique style of this young designer looking to step out of the box. With A Letter To Jane, Esme presents fresh, entrancing designs that truly capture her voice in this industry. When you think of Fall/Winter, you rarely think of sweet dresses inspired by a European countryside; but that is exactly what Vania Romoff brought with her collection Secret Garden. Inspired by the images from the 1975 film, "Picnic at Hanging Rock," the collection was a mix of lightness and restrained silhouettes, with flattering collars, ruffled sleeves, and lace. It was comfortable yet relaxed in a dressed-down-but-dressed-well kind of way, pieces that you could see yourself wearing while lounging at a European-inspired country patio with strawberries and a cup of tea. It was sweet, demure, and brought a touch of cool, sophisticated ease onto the runway. 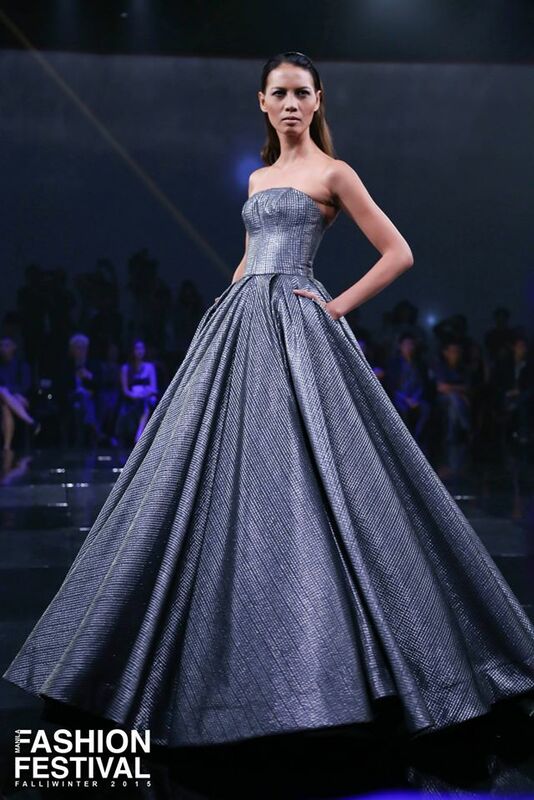 Which designer was your favourite at the Manila Fashion Festival? Let us know in the comment box below!